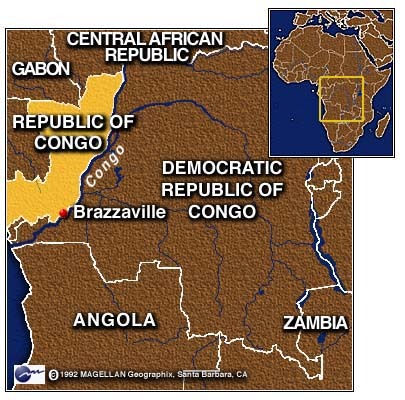 BRAZZAVILLE, Republic of Congo (CNN) -- The militia loyal to former Republic of Congo dictator Denis Sassou-Nguesso began shelling government troops at Brazzaville's international airport Sunday morning, while French forces tried to wrap up an evacuation mission and begin pulling out. 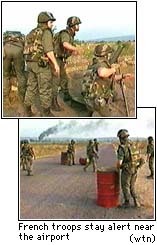 The mortar fire continued throughout the morning, as Sassou-Nguesso's Cobra militia moved two T-55 tanks -- apparently only one of them working -- closer to the airport. Government troops, loyal to President Pascal Lissouba, fired back. "They (the militia) are using 100mm mortar and firing at the army positions at the air base at the far side of the airport," said French army spokesman Col. Henry Pelissier. Pelissier said the French had no plans to join the shooting unless they were directly attacked. About 1,200 French troops, with 60-70 people waiting for evacuation at the private Aeroclub pilot's club next to the airport, had hoped to dismantle their base Sunday and begin pulling out. 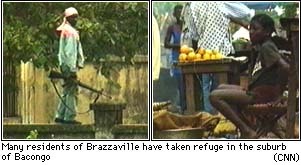 The French have evacuated more than 5,000 people since fighting began June 5, when government forces tried to disarm Sassou-Nguesso's militia in advance of next month's elections. Representatives on both sides were to begin arriving Sunday in Libreville, Gabon, for talks hosted by Gabon's president, Omar Bongo. The two sides agreed earlier this week on the meetings, aimed at securing the peace and ensuring elections set for July 27. Both Lissouba and Sassou-Nguesso -- Lissouba's predecessor at the republic's helm -- are running for president in the elections. "We must do everything to ensure that the elections are held within the delays foreseen in the constitution," said U.N. special envoy Mohamed Sahnoun after talking with envoys from all sides. "Democracy must definitely be put back on track." Lissouba sent his army to disarm Sassou-Nguesso's militia earlier this month, fearing they would try to disrupt the elections. But Sassou-Nguesso accused Lissouba of trying to delay the elections himself by stirring up trouble where there was none. Both sides have tentatively approved the idea of an international peacekeeping force. Lissouba told Africa Number One radio that he favors an African force, "possibly led by France with whom we are used to working." Sassou-Nguesso said he wanted guarantees that the force "does not become permanent." There was no indication that the talks would be postponed in light of Sunday's fighting. Officials hoped the talks, which resulted from a lower level meeting Saturday, would bring about a summit between Sassou-Nguesso and Lissouba. Correspondent Catherine Bond and Reuters contributed to this report.